Bullfrog's Currents of Change profiles Canadians helping to transform the energy landscape through renewable energy. 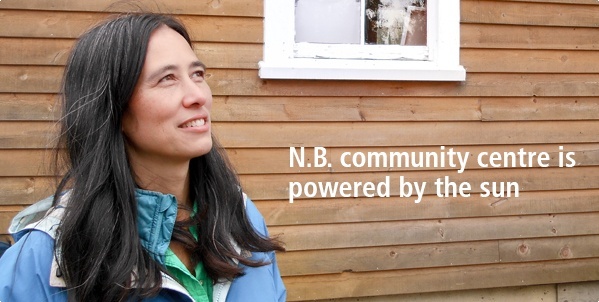 This month we're featuring Tegan Wong-Daughtery (above), Co-Founder of the Knowlesville Art and Nature Centre in New Brunswick. Support from you and other members of our community helped put solar panels on the Centre—the panels now power the building and serve as an educational tool for students about the benefits of green energy. See a project (that you helped support) come to life! Watch a turbine being built in this video of Gunn's Hill Wind Farm near Woodstock, Ontario. Gunn's Hill is the only wind farm in Ontario to be owned by a community co-op: the Oxford Community Energy Co-op. The project, which was funded in part by Bullfrog customers, was filmed during construction—and we've turned the footage into an educational video for you and your family to enjoy! What would a clean, connected Canada look like? What would Canada look like in 50 years? In its latest blog post, Bullfrog partner Clean Energy Canada envisions how Canadian homes and workplaces can play a part in implementing a nationwide renewable energy strategy. Want to learn more? Click here to check out an infographic as well a comprehensive article discussing Canada's renewable energy opportunities. Bullfrog Power was thrilled to receive the 20/20 Leadership Award at the Ontario Sustainable Energy Association (OSEA) Powering Prosperity Awards for helping Ontario move closer to achieving a thriving sustainable energy sector. Bullfrog Power CEO Ron Seftel (above) accepted the award from OSEA board member Zachary McCue on behalf of the Bullfrog community. Intelligarde, a 30-year-old Canadian security company and fellow B Corp, is one of the latest businesses to join the bullfrogpowered community. The firm champions innovative security employment through its Employee Share Ownership Program, which allows employees to receive shares of the company. Intelligarde is bullfrogpowering its offices with green electricity—and is also the first security firm to choose Bullfrog's green fuel for a portion of its fleet. Visit Intelligarde Security to learn more about what the organization is doing to improve the security industry and make a positive social impact. Have you visited the bees at the MTCC? Last year, the bullfrogpowered Metro Toronto Convention Centre (MTCC) adopted four honeybee hives! The bees—which live on the roof of the South Building—are currently hibernating for the winter, but will begin working like their usual busy selves come this spring. Bees are crucial to supporting our global food supply. To further support maintaining the local bee population, the MTCC is also accommodating its landscaping to support the little pollinators. Bullfrog partner SolarShare is pleased to present bullfrogpowered Ontario screenings of To the Ends of the Earth, a documentary that examines the rise of extreme energy extraction in Canada and its impact on the environment, economy and local communities. SolarShare will host bullfrogpowered screenings in London, Guelph and Kingston—click here to learn more and to book your tickets! At the screenings, you'll also have a chance to learn more about SolarShare's Solar Bonds program. 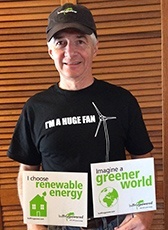 A message from one of our green energy champions! "I've been a passionate advocate for Bullfrog Power since it began in Ontario, and take every opportunity to spread the word. For example, during the winter, I put my bullfrogpowered lawn signs in the rear window of our Honda Civic, and in the spring I put them back into our yard!" Thanks Don! Be sure to check out Don's children's book, The Story of Todd the Toad.